I was explaining at some point that string is an immutable type. That means that once you assign a value to a string variable, you cannot directly modify it anymore. This also means that any string operation using any function such as Trim(), Replace(), ToUpper(), etc, will actually create a new string in memory where the resulting value will be stored, and it will delete the old, initial value. This behavior is a very complex one, involving pointers and references, and it has many advantages, but in some cases it can cause performance problems. result = "A new string!" What will happen in the memory? When we declare the str1 and str2 variables, they will be stored in a special memory called the Heap. When we concatenate them, we assign the resulting value to a third variable. So, now we have three values in memory and three variables pointing to them, and this is the expected result. However, when we change the value of the already existing variable result, we are actually allocating a new memory area, store the new string in it, and delete the string value that was located in the previous location. This process can take time, specially when repeated many, many times, like in a loop. In C#, we don’t have to worry about manually deleting the variable values that we no longer need, like in other languages such as C or C++. There is a special component called Garbage Collector that automatically cleans up any unused resources, but this comes with a price: whenever it performs the cleaning, it takes quite some time and it overall slows down the execution speed. So, not only we force the GC to clean the memory all the time, we also make the program transfer characters from one place to another in memory (when string concatenation is executed), which is slow, especially if the strings are long. 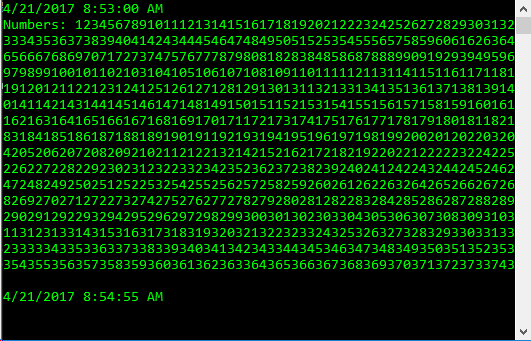 We display the current time at the moment we start the concatenation (though we didn’t learn about the DateTime object yet), then we perform the joining of the string inside the loop, and finally display the current time again, to be able to compare the elapsed time. As you can see, on a Intel Quad Core i5 4590 CPU, running at 3.3 GHz, this took almost two minutes. Some of you might say, “yeah, but still, there’s 200.000 operations to be performed! That has to take some time!”, and you would be wrong. Computers are VERY good at performing repeated, extremely fast operations, specially on modern nowadays CPU’s. But most importantly, in 2017, making your users wait 2 minutes for an operation is almost unacceptable, and many will close it before this gets a chance to complete. The problem with time-consuming loop processing is related to the way strings work in memory. Each iteration creates a new object in the Heap and point the reference to it, as I explained. This process requires a certain physical time. 1. An area of memory is allocated for recording the next number of concatenation result. This memory is used only temporarily while concatenating, and is called a buffer. 2. The old string is moved into the new buffer. If the string is long (say 500 KB, 5 MB or 50 MB), it can be quite slow! 3. 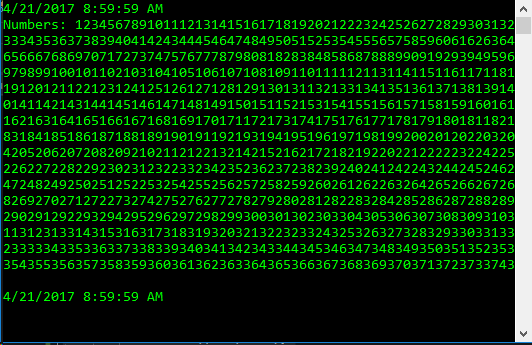 Next number is concatenated to the buffer. 4. The buffer is converted to a string. 5. The old string and the temporary buffer become unused. Later they are destroyed by the Garbage Collector. This may also be a slow operation. I don’t know about you, but 200.000 operations in less than a second, now, that’s what I call a performance increase! The required time is actually in the order of milliseconds! The way we use StringBuilder is by creating a new instance of it, and then use the Append() method to concatenate strings to it. You will better understand this process when you will learn the next chapter. For the time being, just remember that StringBuilder is a MUCH more efficient way of concatenating strings. This entry was posted on Friday, April 21st, 2017 at 09:08 and is filed under Strings And Text Processing. You can follow any responses to this entry through the RSS 2.0 feed. You can skip to the end and leave a response. Pinging is currently not allowed. Posts (RSS) and Comments (RSS). 505 interogations. 0.399 seconds.